Inside of window before the install. The process of removing the old aluminium inserts from the original box frame right through to installation of the new double glazed sash windows. 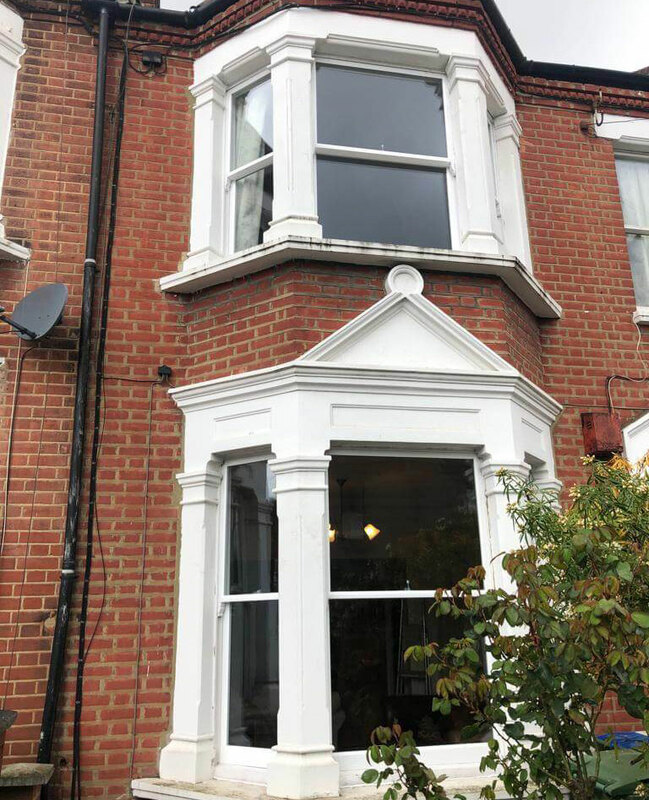 The first stage of having new double glazed sash windows installed is a site visit and quote. We will always pop round and take a good look at your windows prior to any confirmation of costs when double glazing is concerned. Because of the significance of the investment there’s not really much that we can do in terms of offering fixed price over the phone, genuinely no two jobs are the same, and all joinery is custom made, and bespoke handcrafted. Whilst that being said, we can definitely offer a guide, we just simply can’t confirm that price without site inspection. 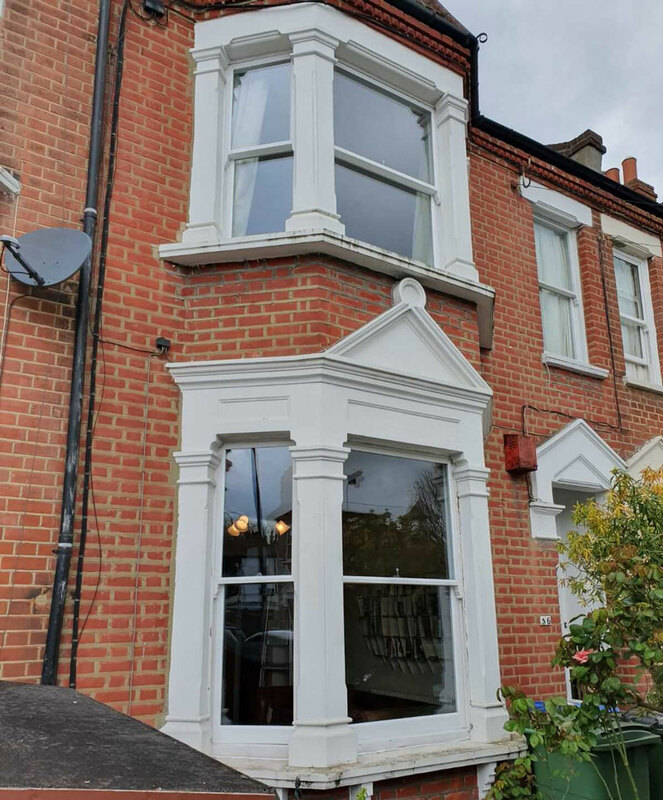 That’s why we offer comprehensive double glazed sash window costs on our website to make sure that we are both on the same wavelength in terms of cost and scope of work. Once one of our carpenters makes a site inspection and satisfied that we can work with the original frames, we will then email you an entire quote that is it a fixed price or would have options for worst case scenarios if we are unable to access or see the sill. In most of these instances where they install inserts to the original box frame, they’ll also put panelling or trims over the top of the original sill sections, this is a giveaway that there’s either a problem or that they didn’t want to decorate the original sill. This means that there’s a fair chance of sash window repairs and splices that we would need to carry out. It could even be an entire sill section needs replacing. Either way, we will give you the worst case scenarios in advance so you’re not left with the situation of paying more than you expected. Another inside of a double glazed bay sash window ready for decoration. On the day that we install our double glazed windows. 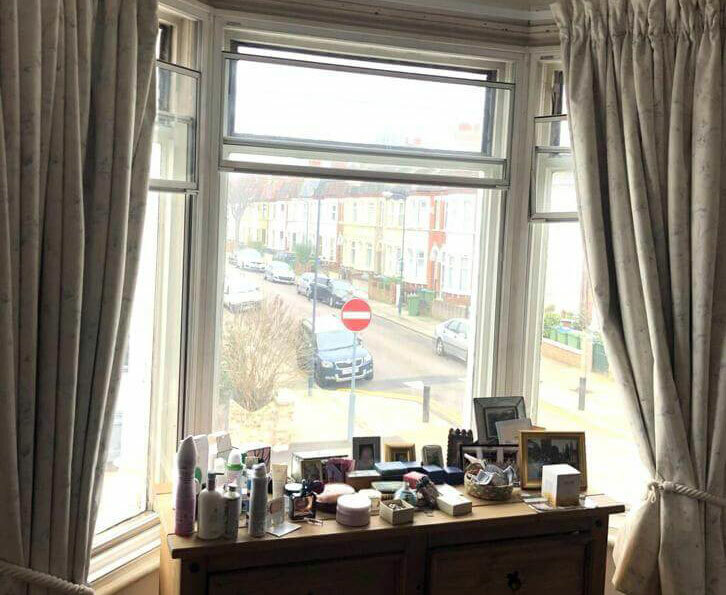 On the day that we install your double glazed sash windows, it is highly appreciated if personal belongings have been removed from the local vicinity of the windows, especially electrical equipment. This helps us to concentrate on the install and make sure that we give you the right job. If there’s any issue moving any large furniture or removal of curtains and blinds, then please do let us know prior to the install so the we can prepare for this and factor it in the time the install time overall. The install won’t take too long; even on a house that has two bay windows we should normally be done within a couple of days, maybe three if there’s extensive rot. 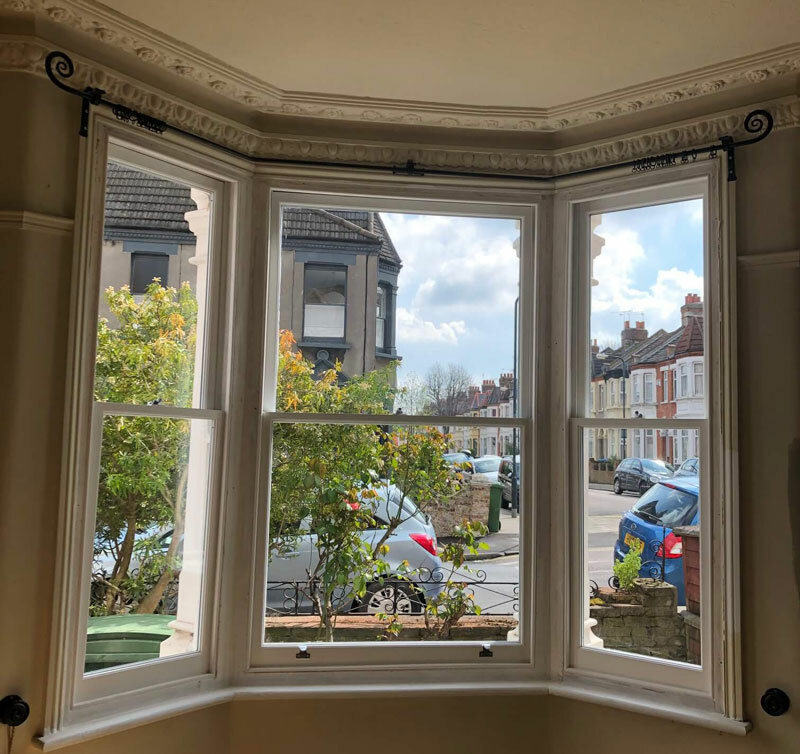 Here’s a look at the end of day one on this install, where we’ve removed the aluminium inserts from the upper box frame and then installed our new sash windows into the original frame. 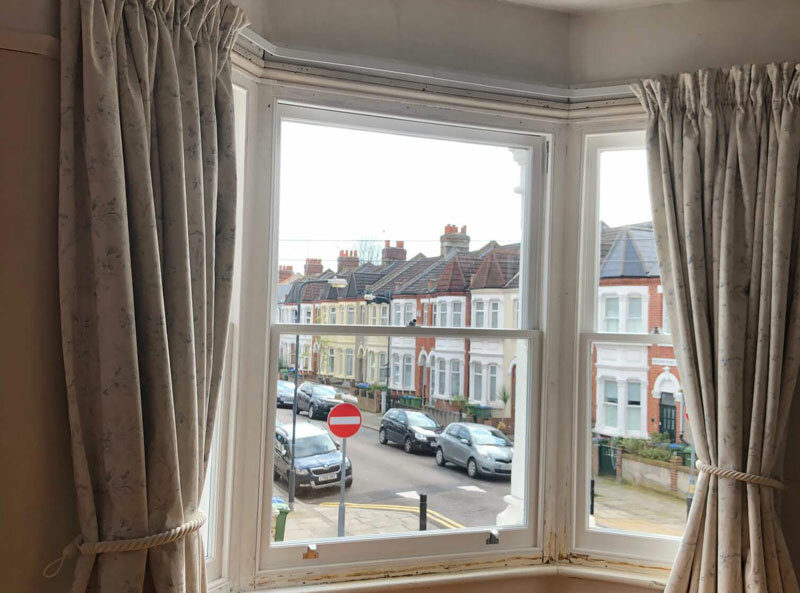 This point is probably worth mentioning that we don’t just install double glazed sash windows, we also install a comprehensive draught proofing system into the frame so they are truly efficient once we are finished. Front of property with one bay completed at the end of the first day. Also after showing you the outside of the bay on the first day, here’s a look at this window from the inside, it completely transforms the room! Inside of double glazed sash window after aluminium insert removed. We repair the original box frames whilst installing double glazed sash windows. On this occasion there was actually the need to replace many of the sills on these windows. We provisionally allowed to replace all 6 of the sills, but in the end there was only two sills that required full replacement, as well as two sill repairs, and two of the box frames also needed splicing as well. The net result of the quote was costs were reduced by £252. We prefer that the quote is over prior, and there are no ugly surprises at the end. 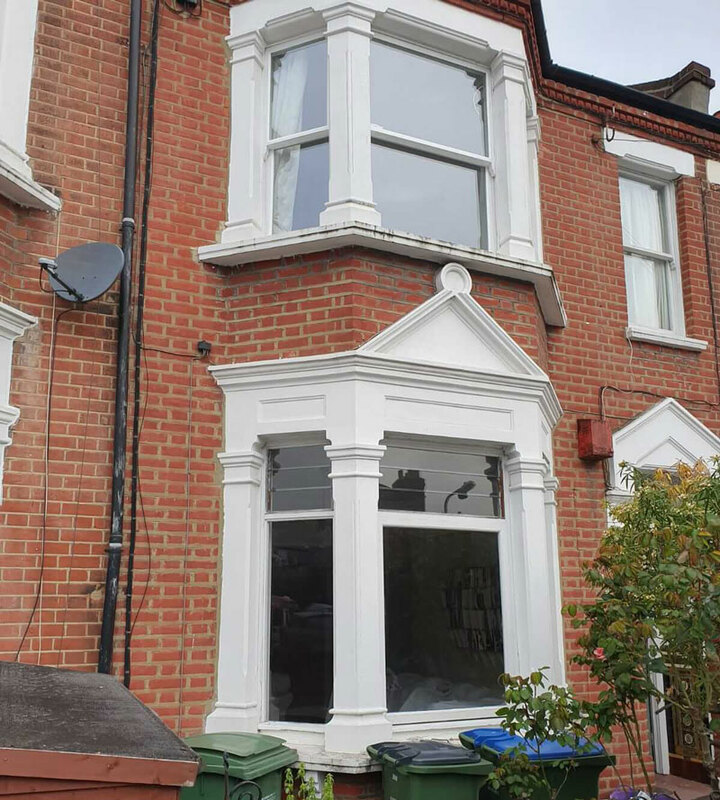 In almost all cases where you will have sash window sills replaced, and you’re having new double glazed sash, we will use a hardwood sill. It doesn’t make sense to have hardwood sash and softwood sill, so of course, we match them up. This helps you in having lasting quality product. 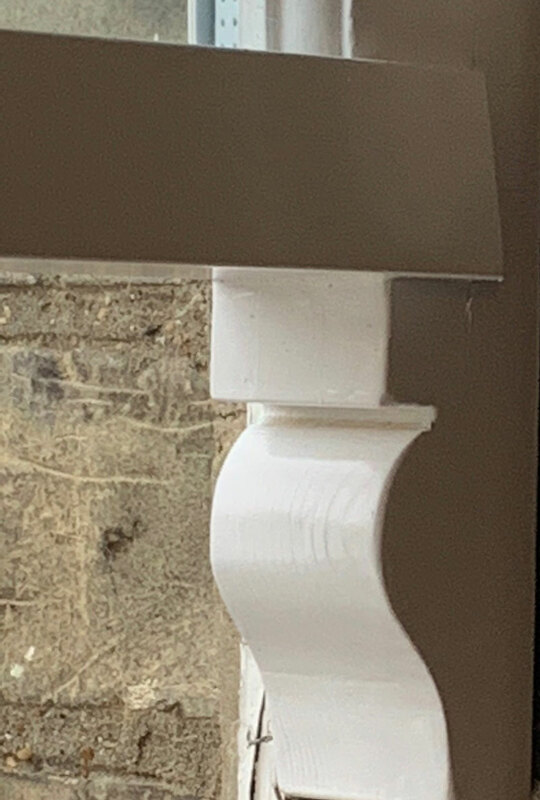 Even if you don’t do any decoration for a few years after the install you should get away with it because of the quality of timber and we’ve primed and undercoated these repairs. On the second day of the double glazed sash window install. One second day of our sash window install, we remove the lower bay aluminium inserts and tidy them up too. Once the frames are repaired and structurally good we can then begin the process of installing the double glazed sash to them. At this point we will do any touching up and try to tidy the windows in as best as possible so the install looks smart. We also install our furniture and locks where quoted for. Normally we will provide a catch and lifts. Security restrictors, or sash stops as you may know them are additional. As you can see from pictures, the frames require some painting to finish this install. We will happily supply a complete painting services for the frames if the customer requests this, but there’s a good opportunity for you to save a little bit of money if you’re DIY capable and ready for a bit of painting on these frames. All of the frames are normally square sections, and very easy to sand rub down and then paint. The intricate part of painting and decorating is the sash itself. This is where you have to cut into the glass can be time consuming and also quite difficult. We supply the sashes with a full factory spray finish there’s absolutely no decoration on them whatsoever if there is anything at all, it’s just minor blemishes. It makes perfect sense for the homeowner to do a bit of painting on the frames and save the money. We find that the best match for our 60% sheen spray paint system is satinwood with a hand finish brush. Due to the nature of our semi-permeable spray paint, it doesn’t hand finished so well(leaves lines), and satinwood seems to give a much more desirable effect and finish, so there’s no advantage at all to us doing it. Here’s an internal look at the sash, as you can see there isn’t really much to do in terms of painting at all. Many of my clients that have recently decorated their windows prior and have the sash installed don’t actually bother and leave them be. Double glazed sash windows at another angle. All in all ,I was really pleased with the transformation of this property, it makes such a difference when you have the aluminium inserts into the original frame removed and replaced by traditional sliding double glazed sash that are like-for-like with the original design of the property and other buildings around. We even go as far as matching the mouldings known as the horns underneath the top sash to the other properties. This gives the impression of a completely original window. If you’re not quite sure what the horn is, then take a little look at the top sash and then to the left and right underneath that you’ll see the decorative mould. I don’t know if you’ve ever noticed this on your own windows but the original sashes would have all matched each other along your road. We obviously take the time to manufacture these as close as possible too. Something that obviously plastic and aluminium window providers simply cannot do. If you’re still unsure then here is a little picture of the horn. The horn on a traditional sash window. I hope the article on double glazed sash windows into the original box frame where aluminium inserts were fitted before has really helped you. 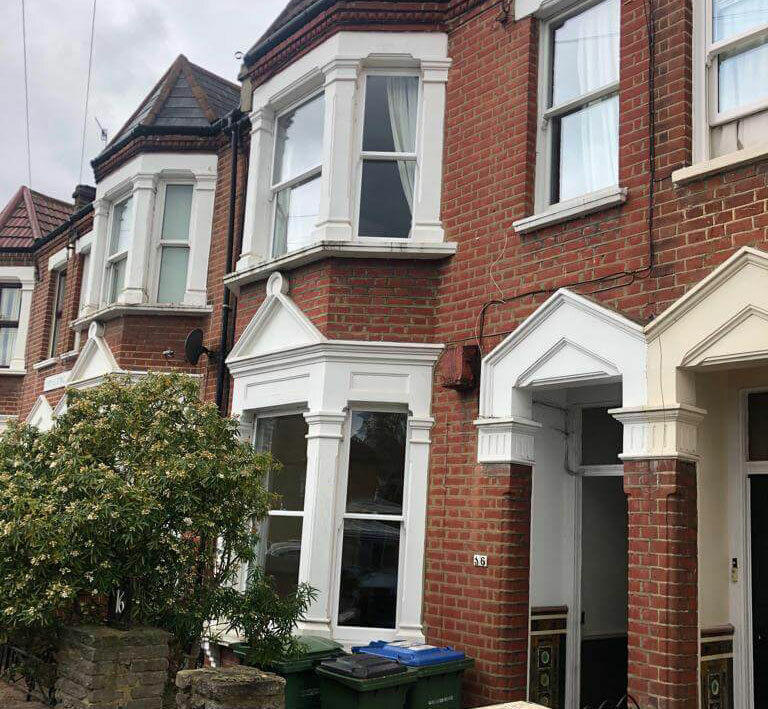 This homeowner was fortunate enough to literally save thousands of pounds on entire replacement and practically the same result in terms of energy efficiency and acoustic and soundproofing performance. This was definitely assisted by the fact that the side windows were fixed and sealed shut. 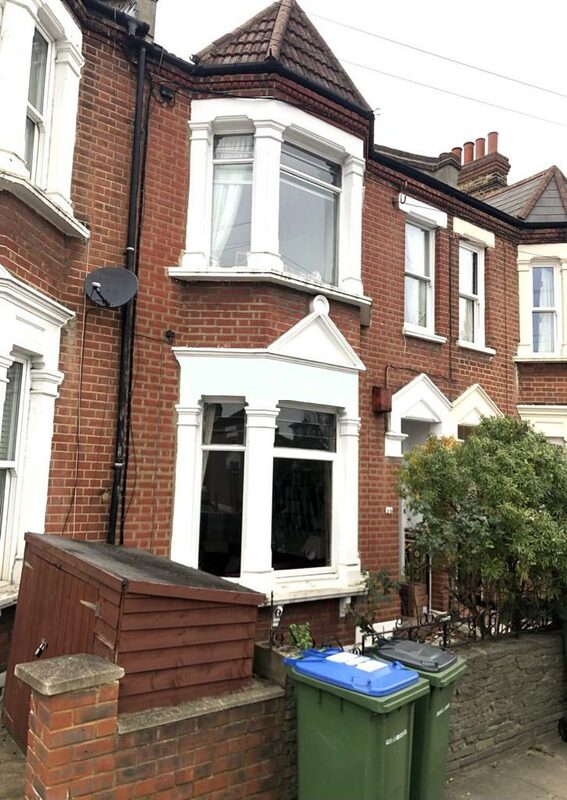 Would love to hear from you if your property is in the same condition and would be more than happy to reinstate it to its former glory through sympathetic like-for-like double-glazed sash.